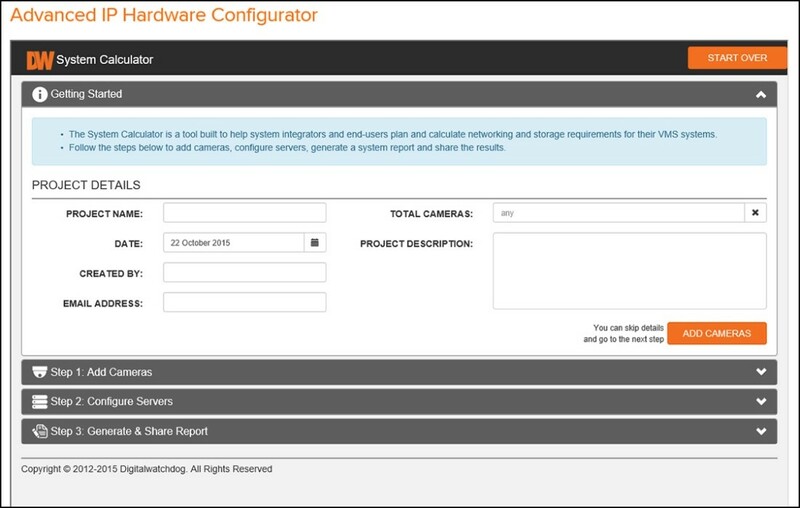 Screenshot of the IP Hardware Configurator. Cerritos, CA (October 22, 2015) – DW®, the industry leader in digital recorders, surveillance cameras and related management software, announces the release of our new Advanced IP Hardware Configurator. This new tool offers advanced features for project building and hardware calculation. This allows users to accurately design video surveillance systems that are customized to their specific needs. The Advanced Hardware Configurator makes it easy for users to design systems by calculating bandwidth and storage, assigning the cameras needed per server, defining server capacity and exporting the information in an easy to follow report. The Configurator offers features such as universal camera management, offering accurate bandwidth and recording recommendations for any camera on the market, regardless of manufacturer. The server section allows users to select one of DW®’s Blackjack™ network video recorders with their preset hardware and storage options, or to build a custom server, selecting the processor, internal storage or RAID options. Users can assign specific cameras to specific servers, personalizing the report to match the project to the smallest detail. Users can also export the report as a PDF for reference, or contact our expert sales team for more information to bring the system to life. The new advanced IP Hardware Configurator is available for free on DW®’s website, Support > Calculators. DW®® (DW®) empowers our customers as the industry-leading single source of value-driven complete solutions for all video surveillance applications (analog / hybrid / IP enterprise), focusing on ease of use and ROI. DW® products offer technologically-advanced features including Star-Light™ super low light technology, WDR, Smart DNR™ and Smart IR™. Complete IP megapixel surveillance solutions include single- and multi-sensor MEGApix® cameras and edge recording systems, VMAX IP™ NVRs for SMB, Blackjack™ Enterprise NVRs and DW Spectrum™ IPVMS for server, mobile and on-camera control. Complete analog surveillance solutions include single- and multi-sensor STAR-LIGHT AHD™ 1080p and STAR-LIGHT MPA™ 1.3MP 960H cameras, VMAX™ DVRs and mobile management applications.